Sunday Morning Live Educational Hour. At this site, you may find out about the mission and ministry of the wider expression of God’s church. Lutheran Disaster Relief information, and news releases pertaining to the ELCA are found here, as well. At this site, you may find out about the work being done in and through our local synod of the ELCA in the geographic area of the 29 counties in the southwestern corner of Minnesota. You may also find a link that enables you to subscribe to the weekly updates in our synod’s e-news, and the Faithful and Fruitful Blog. This site will provide information about how the ELCA’s largest seminary, located in St. Paul, Minnesota, prepares its students for ordained ministry and other types of leadership In God’s church. You may also find a link to subscribe to online daily devotions called, “God Pause” that are provided by the seminary community. This site provides information about the Lutheran community that is committed to make Christ known to the world through prayer, sharing the gospel, and encouraging Christians everywhere in this global task. At the present time, Pastor Charles and Anita Jackson are serving in Mongolia with WMPL. Anita (Olson) Jackson is a daughter of Christ Lutheran Church here in Cottonwood. Christ Lutheran members at Robin's Nest in Jamaica. At this site, you may read about the work being done in the name of Jesus to care for and nurture vulnerable children who don’t otherwise have adults that can parent for them in Montego Bay, Jamaica. 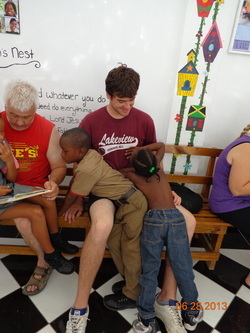 Several people from Christ Lutheran and the surrounding community have traveled to Jamaica to serve at Robin’s Nest in a variety of ways as we accompany the staff and the work being done there. This site will take you to the home page of Our Savior’s Lutheran Church in New Ulm, Minnesota, and there you will find a tab for “Reaching Out” under which you may read about the work being done at the Kikatiti School in Kikatiti, Tanzania, about 30 miles west of the large city of Arusha. Several members from Christ Lutheran Church visited and worked at the school in the fall of 2013. At these two camping ministry sites, you will see photos and read about the adventures that await youth and adults alike as they take part in all that is offered at our Bible camps nearby. Green Lake Lutheran Ministries is located in Spicer, Minnesota; and Shetek Lutheran Ministries is located on Keeley Island on Lake Shetek, outside of Slayton, Minnesota.